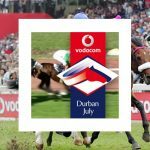 The Durban July Handicap is a South African Thoroughbred horse race held annually on the first Saturday of July since 1897 at Greyville Racecourse in Durban, KwaZulu-Natal. Raced on turf, the Durban July Handicap is open to horses of all ages. It is South Africa’s premier horse racing event and currently offers a purse of R4.25 million (app. US$288,000).